If you make 28 balls out of a pound of lead then the diameter of a single ball measures about .55 of an inch. The 28 gauge, being 3/4 the size of a 12 gauge, yields a petite game gun that is a delight to shoot. I am no 28 gauge expert but so far, if I do what I am supposed to do, this little gun busts targets and kills birds as well as a 12 gauge – given that I shoot at things within range (say 30 yards?). Of course putting an additional 25% (or more) lead in the air with a 12 gauge gives the shooter more range and a better chance to hit the target! A lighter gun can be a challenge to shoot well but this little gun is a pleasure to carry in the field. Here is an Armas Garbi 101 in 28 Gauge. Here is Franchi’s 48 AL 20 gauge deluxe shotgun. We took this brand new gun out to the clays course to try it out. It is a light, slim, petite shotgun and was great fun to shoot. Even though it is light it feels solid and well built. It will be perfect for dove, quail, any preserve bird and I am sure it would kill wild pheasants as well. Being recoil operated (as opposed to gas operated) it reminds me of shooting the great Browning A-5. This is a classy and elegant gun. Synthetics may be more practical and durable, but who doesn’t love the look and feel of walnut and steel (or aluminum)? With time to kill over the holiday, I worked on some gun photography. The challenge is managing light and reflection. This shot of a Spanish sidelock came out pretty good. Since I started jacking around with this blog and the related gun photography, I really wanted to take a quality, full length picture of a shotgun. Sounds easy doesn’t it? Well, it’s not!! Guns are really hard to photograph. 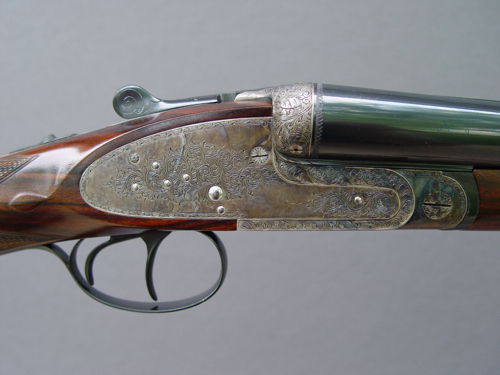 Dealing with glare or reflection off of finely finished surfaces and holding the gun while appearing to not be holding it are two major challenges. This, along with picking a background that will show it off all add up to a pretty tough problem for the amateur photographer such as myself. Happily, most of these challenges were solved by Photoshop. I have to say that Photoshop is the most powerful, complex, effective, frustrating, amazing, time consuming, magical, and non-intuitive piece of software I have ever used. There are only two consumer technology products that are so well known and influential that their names have become verbs. Photoshop is one . . . I can’t remember what the other one is . . . I will Google it later. I do think Photoshop is a lot like taxidermy. If you aren’t committed to learning and practicing it, your end product will look a bit off. I highly recommend the most excellent guide “Photoshop CC, the missing manual” by Lesa Snider if you are thinking of giving it a try. Here are my first attempts. The background is the concrete by my mailbox which I darkened up a bit. On our last hunting trip, the Armas Garbi was tossed into the truck by a weary (lazy) hunter producing a handsome scratch on the right barrel. In addition to this new scratch, there had been a decade of sweaty hands, random splatters of dove blood and unkind encounters with brush, fences and trucks. It was time to have the barrels refinished so I sent them to Turnbull Mfg Co. in Bloomfield, NY for rust bluing. These guys are not cheap, maybe the most expensive, but they are well known for their high quality gun finishes. This was one time that the extra expense paid off. They came back as near perfect as I could have hoped for. 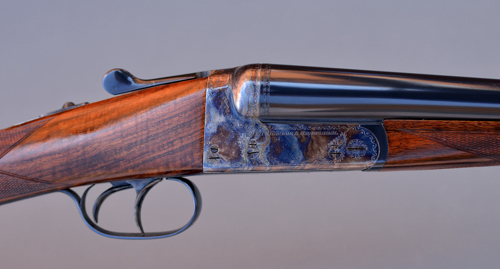 In fact, this finish looks better than what came on the gun new, in my opinion. Check it out below. I am sorry that I did not take some “before” pictures. A few yards of black fabric provides a rich background but managing light is the real challenge with photographing firearms. Plenty of soft, indirect light is key but that is easier said than done. The black abyss showcases the walnut and steel and helps make these amateur photos look pretty good. Check out this earlier post on the AyA 4/53. These really are nice guns so here is another one. The Spanish Aguirre y Aranzabal boxlock model 4/53 has been in production since the 1960s. It is a utilitarian game gun that provides fine handling characteristics without the cost of a luxury finish. An appealing everyday working gun, this 12 gauge has the right configuration (imho) with double triggers, straight stock, splinter forend and 28″ barrels. It also has great dimensions with a 1 1/2″ drop at comb, 2 1/4″ drop at heel and a 15″ length of pull. If you try, you can find these for under $3k. A bargain for a quality double gun. Wild west Texas Bobs and the Garbi shotgun. The title sounds like a magazine I’d like to get. 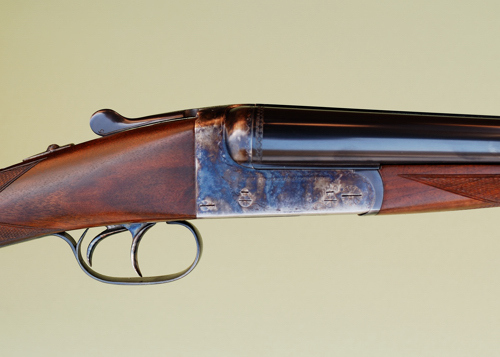 Armas Garbi 101 Classic side by side shotgun from William Larkin Moore. 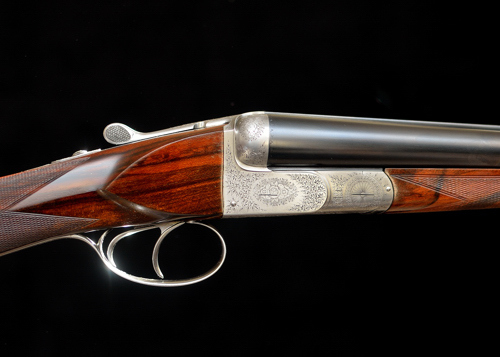 This gun was new in 2003 and has provided 7 years of flawless service; thousands of rounds in the field and on the clays course and not one malfunction.